Feeling confident in their ability to control their bodies whilst beaming with joy from learning new and vibrant skills. That’s how Capoeira CDO Perth students walk out the door after their capoeira classes week after week. If you are looking for a holistic and exciting activity for your children that will encourage them to explore the joys of being active, and, interactive, then these classes are for you! 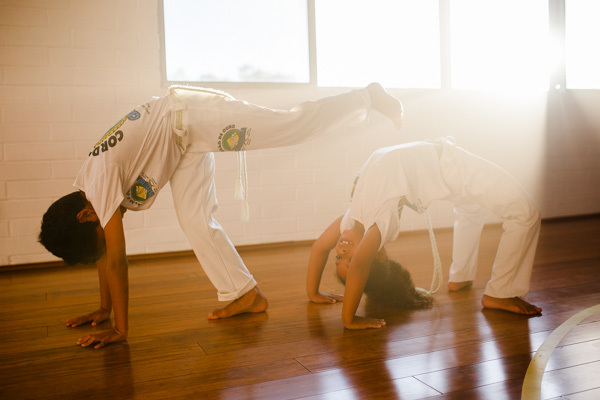 Through a variety of interactive, fun, and engaging activities, children explore many facets of the Capoeira experience, including moving, kicking, dodging, acrobatics, singing & playing percussive instruments. Our Capoeira classes cater for the students’ cognitive and physical development and are designed to enhance social skills, boost confidence, nurture resilience and inspire a passion for movement and music all while learning the foundations and rich culture of Capoeira. As with other martial arts, Capoeira has its own grading system through cordões (cords). New students will receive the cordão cinza claro (light grey cord) as a symbol that they have made a start on their Capoeira journey. The first cord that is officially given is dependent upon the students’ age. The younger kids (Capoeira Sprouts) are given the light green with the grey tip and the older kids (Capoeira Seedlings) are given the light green cords. The students can receive these at our annual Capoeira & Brazilian Festival held in the second semester. Capoeira helps develop balance, coordination, general fitness, flexibility, sense of rhythm and body awareness. Children benefit from increased self-esteem and become more confident. Children develop a sense of identity as an individual, as a member of a nurturing community and as a member of a global society. Capoeira helps to build children's personalities through self-expression in a fun and playful way. The cultural aspect enriches children and allows them to experience different aspects of the world, being the Brazilian culture, and loving and accepting our multicultural country. Our Capoeira Sprouts classes are designed specifically for 3-year-olds up to 6-year-olds. Your child will simply love coming to these Capoeira classes, having a sensational experience in Capoeira Sprouts at Capoeira CDO Perth. 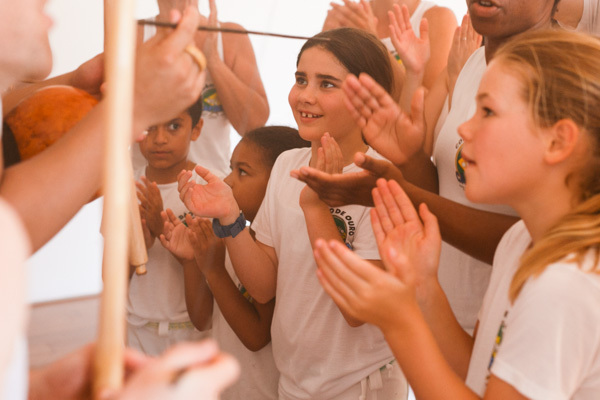 The children’s’ independence is fostered through excellence in teaching by the teachers to incentivise learning with peers and teachers followed by a demonstration of learnt skills and abilities for the caregivers and siblings who are invited to join in the roda (the circle in which Capoeira is played). Sign up for a FREE INTRO CLASS so your children can experience Capoeira and see if our school and classes are a good fit for them before committing to enrolling in a membership. Ready to sign up? Enrol your little sprout in our Capoeira classes today. 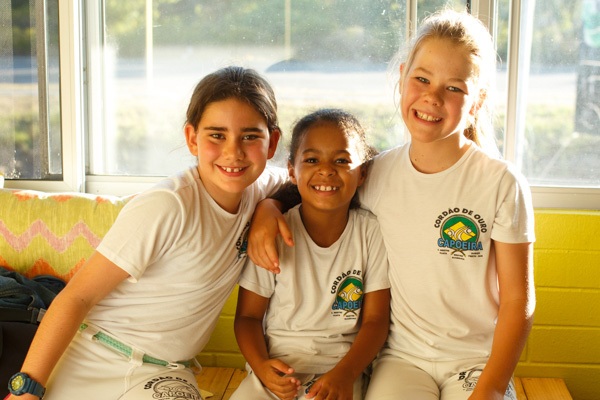 Our Capoeira Seedlings classes are designed specifically for 7-year-olds up to 11-year-olds. 12-year-olds and above are able to attend the Adults Capoeira Essentials classes. Your child will feel that something grander from coming to these Capoeira classes, having an inspired experience in Capoeira Seedlings at Capoeira CDO Perth. Classes are for kids only. Parents and caregivers can watch from the reception area. Ready to sign up? Enrol your growing seedling in our Capoeira classes today! Our Capoeira Saplings is a class for advanced kids through invitation only. The students that demonstrate exceptional ability in Capoeira are chosen to participate in this elite group. All students are given the opportunity to be invited to this group and through hard work and training can develop the necessary skills and ability to enter the advanced Saplings group. Within this group will also be chosen the Capoeira CDO Perth performing team which will be composed of the Saplings that have developed advanced techniques and training and will perform their amazing skill in several of the years’ scheduled public performances. The performing team shall also be entered in some state and potentially national and international competitions.